This event was an incredible experience that changed the history of pavement art. In 1991, after an absence of several years, I returned to Grazie’s piazza for this momentous occasion. It was announced that Pope John Paul II would visit Mantua and the sanctuary at Grazie. It had been over five centuries since a pope had last set foot on Mantuan soil. In the mid-1400s, Pius II had arrived to ask the Duke of Mantua to supply him with troops for a crusade. The residents of Mantua had waited an astonishingly long time for a pope to return, and a visit from the beloved Pope John Paul II was a particularly blessed event. It was decided that a grand work in Grazie’s piazza was to be commissioned in honor of the papal visit. This was a bold decision, since the Church had an ambivalent attitude towards pavement art. Some of the clergy perceived it as competing with the church by using sacred images for private gain. The town therefore hoped to finally obtain the Pope’s blessing for the art form. 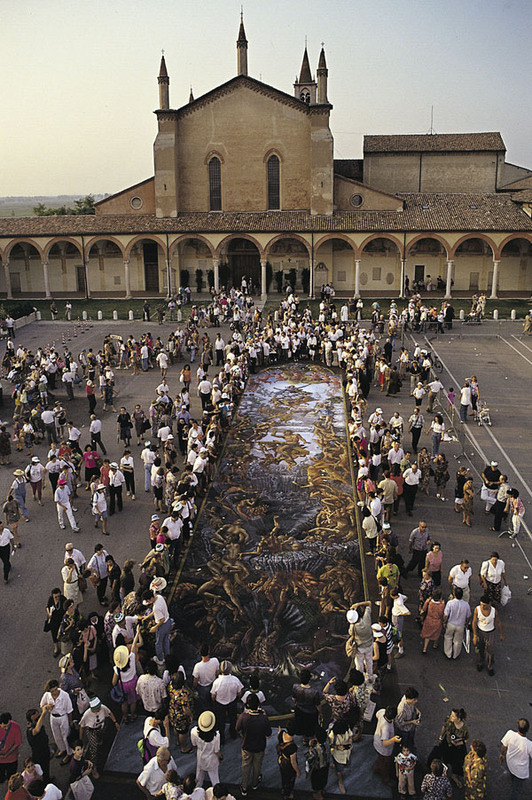 A special congress of madonnari was convened, and I was elected to design and direct the execution of a monumental street painting. I designed a composition using the theme of the Last Judgment, which measured fifteen feet by seventy-five feet. The painting contained 170 figures, most of which were life-sized. The city fathers at Grazie were concerned that I had lost my mind when I proposed the complicated design, but the street painters enthusiastically accepted the challenge.Thirty-two madonnari from various countries were selected for the project, and we began by making pastels, in order to work with a unified color palette. Throughout the event, there was great enthusiasm and camaraderie. The artists were selected for their skill level, and with high spirits and a dozen languages floating in the air, the group got through difficult setbacks as the picture went through three thunderstorms. The artists worked in the piazza for ten days straight, breaking briefly for lunch and working until the last light was gone. In the end, we finished the painting just two hours before the Pope arrived! During the event I was introduced personally to the Pope. I am not catholic and had not even thought much about what the experience would feel like, so it was very surprising. The Pope looked into my eyes, and I could feel the aura of sanctity in his presence. He grasped my forearm and held it for a long time, and I sensed an intense spiritual power coming through his hand. It was very powerful and significant experience for me. After the introduction, the former mayor, Attilio Flisi, quietly pressed a piece of white chalk into the Pope’s hand. 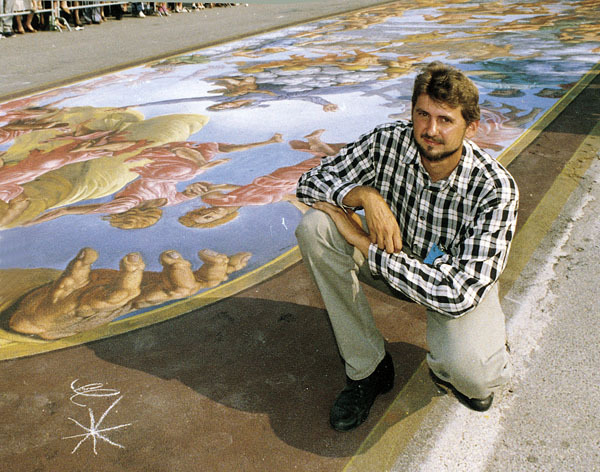 The Pope bent down and signed the street painting with his papal symbol next to the right hand of God. The chalk broke several times, but the Pope persisted until he was finished. For the first time in history, the highest member of the Church had consecrated a street painting. 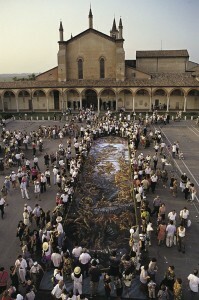 The act was taken to be the Catholic Church’s long-awaited acceptance of street painting as a sacred art. Pope John Paul II said, I hope to have communion with the people, that is the most important thing. In the video below the pope can be seen relaxed and enjoying the people of the small community. I did have a mishap during the event. I was a bit late arriving and ended up rushing towards the Pope, at which point I was grabbed by the Vatican security forces and held in a choke hold before the mayor could explain that I was the artist who had designed the work. Looking back on it, I think part of the reason was my unfortunate choice of shirt, (see photo above). The pattern of the material looks like what is worn by the intifada members- no wonder they grabbed me! The morning after the event, I returned to photograph the Pope’s signature alongside the painting, but was too late. The pavement containing the signature was being jackhammered out of the piazza! No one knows better than the folks in Grazie how fleeting pastels can be, and they were determined to preserve the signature in the street painting museum. The hole was quickly filled with a bronze replica to commemorate the spot. Unlike the Pope’s signature, the monumental painting was sacrificed to the elements.